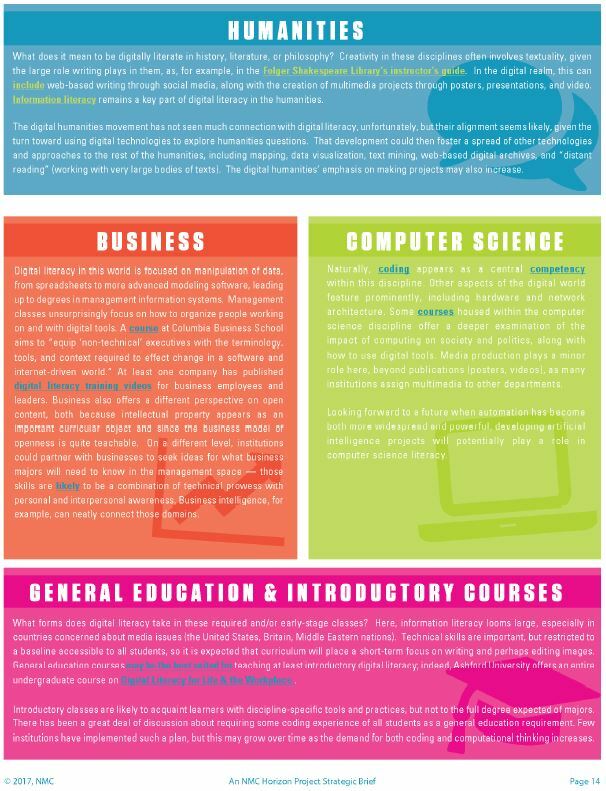 The New Media Consortium (NMC) has released Digital Literacy in Higher Education, Part II: An NMC Horizon Project Strategic Brief, a follow-up to its 2016 strategic brief on digital literacy. But what does it really mean to be digitally literate, and which standards do we use?” said Dr. Eden Dahlstrom, NMC Executive Director. “This report sheds light on the meaning and impact of digital literacy using cross-cultural and multi-disciplinary approaches, highlighting frameworks and exemplars in practice. NMC’s report has identified a need for institutions and thought leaders to consider the ways in which content creation is unequally expressed throughout the world. In an examination of digital literacy within European, Middle Eastern, and African nations (EMEA), research has surfaced unequal access to information technology based on inequalities of economics, gender, race, and political divides. Digital tools themselves are merely enablers, pushing the envelope of what learners can create. No longer is it acceptable for students to be passive consumers of content; they can contribute to the local and global knowledge ecosystem, learning through the act of producing and discussing rich media, applications, and objects. In the words of many institutional mission statements, students do not have to wait until they graduate to change the world. digital literacy now encompasses the important skills of being able to coordinate with others to create something truly original that neither mind would fathom independently. A lack of broad consensus on the meaning of digital literacy still hinders its uptake, although a growing body of research is helping higher education professionals better navigate the continuous adjustments to the field brought about by emerging pedagogies and technologies. Information literacy is a nearly universal component within these digital literacy frameworks. Critically finding, assessing, and using digital content within the vast and sometimes chaotic internet appears as a vital skill in almost every account, including those published beyond libraries. In contrast, media literacy is less widely included in digital literacy publications, possibly due to a focus on scholarly, rather than popular, materials. Digital literacies ultimately combine information and media literacy. African digital literacy is more business-oriented. Frameworks often speak to job skills and digital entrepreneurship. New skills and professions are emphasized, symbolized by the call for “new collar” positions. Digital literacy is a complex phenomenon in 2017, when considered internationally. Nations and regions are creating ways to help their populations grapple with the digital revolution that are shaped by their local situations. In doing so, they cut across the genealogy of digital literacies, touching on its historical components: information literacy, digital skills, and media literacy. How Does Digital Literacy Change Pedagogy? Students are not all digital natives, and do not necessarily have the same level of capabilities. Some need to be taught to use online tools (such as how to navigate a LMS) for learning. However, once digital literacy skills for staff and students are explicitly recognized as important for learning and teaching, critical drivers for pedagogical change are in place. Pedagogy that uses an inquiry based/problem solving approach is a great framework to enhance the use and practice of digital skills/capabilities in the classroom. The current gap between students’ information literacy skills and their need to internalize digital literacy competencies creates an opportunity for academic librarians to support students in the pursuit of civic online reasoning at the core of NMC’s multimodal model of three digital literacies. Academic librarians need a new strategy that evolves information literacy to an expanded role educating digitally literate students. Let’s build a new model in which academic librarians are entrepreneurial collaborators with faculty,55 supporting their classroom efforts to help students become responsible sharers and commentators of news on social media. There is a disconnect between how students experience and interact with technology in their personal lives and how they use technology in their roles as students. Yes, students are digitally savvy, and yes, universities have a role in questioning (insightfully of course) their sometimes brash digital savviness. We have a situation where students are expecting more, but (as I see it) cannot provide a clear demand, while faculty are unable to walk in the shoes of the students.